Blog Challenge (Week 5): Think Thin! I’ve been THINKing Thin for about 50 years! If THINKing Thin worked, I’d be thin as a rail by now, right? But maybe – just maybe – what I was doing was more like WISHFUL THINKing than THINKing Thin. Maybe I need to make some adjustments to my THINKing. 1. I want to be around as long as possible so that I can be sure my son (who has a disability) is well taken care of. 2. I want my sleep apnea to improve. 3. I want to lower my risks for osteoporosis, arthritis, diabetes, high blood pressure, and heart disease. 4. I want to be physically strong enough to do fun things again, like dancing, riding my bike, hiking, and practicing yoga. This was very important because if I didn’t know what I was shooting for, I couldn’t aim accurately and do what was needed to advance. I got off to a good start because, at that point, I was THINKing THIN. How else can I THINK Thin? 1. When planning meals or grocery shopping, I can THINK Thin by asking myself, “Does this recipe/item nourish my body?” If the answer is no, I can make a better choice. The THINKing Thin possibilities are endless. I can ask myself questions and THINK about tracking food intake/exercise, drinking calories, salt intake, etc. Every time I THINK Thin like this I give myself the opportunity to make positive choices and that, in turn, puts me more in control of my wonderful body and my health. 1. I just can’t stop at one late night snack. 2. I don’t like salad and I’m always hungry 15 minutes after I eat one. 3. My mother and her sister were both fat, so my being fat is inevitable. It’s in the genes and there’s nothing I can do about it. 4. I can’t lose weight. 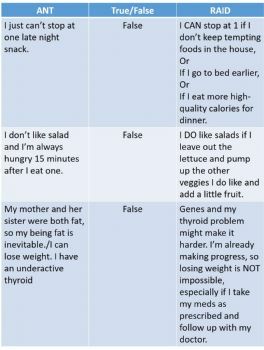 I have an underactive thyroid. This is another list that could go on and on. I’m sure you have your own little “ANT infestation”. We all do. First, I need to face and confront the ANTs and show those little so and so’s who’s boss. If I THINK Thin about it, my ANTs are lies. Lies, Lies, LIES! Despicable lies (I can see the movie now)! What would I do about it when someone else lied about me? After I calmed down a bit, I would confront the lie. And with these ANT’s, if I don’t confront them, that means I accept them as truths and I have to live the rest of my life with the “infestation”. I’d be stuck in this situation – out of control – eating that pint of chocolate mocha chunk ice cream right out of the carton in front of the freezer. Finally, I can THINK about the good things in my life and cultivate gratitude. 1.	my loved ones, especially Nate, Karl, Dottie, and my pets, Beau, Hugs, Desi, Scrabble, Justice, and Topaz. 5.	my progress so far and the progress I will continue to make. How about you, my friends? Go forth and THINK THIN! "If thinking thin worked, I'd be as thin as a rail right now." You could make a fortune on temporary tattoos with that one line alone. I love your "thinking" process. So much more is involved than just thinking thin. My ANTS! I have ANTS! You are so right! If only I could think them into one of those RAID ant hotels where they check in but never check out! They are completely automatic and insistent. Thank you for your perspective, very thought provoking! Every thing in this blog gave me such a good feeling. I'm sitting here smiling at you and feeling pride for you. Cool how a person can invest in another when she sees that other person doing good things. 50 lbs lost is an amazing triumph. Congratulations. To me it just boils down to determination, you will lose weight when you finally make up your mind that it is one of the most important things to you to do. Most of life is like that, I guess when I finally make getting rid of clutter that high on the importance list that will happen too. I noticed a while ago that shopping and eating healthy has become habit with me, just happens now. I still log my meals, but it is more of meal planning to me so I know what I need to do in the kitchen before I go out to work on the farm. Go for it!!!! We both know we can do whatever we set our minds to do. So, I'm thinking healthy. At this point, I don't want to be thin (I don't want to be fat either) . . . I want to be in the best health I can be, for as long as I can.